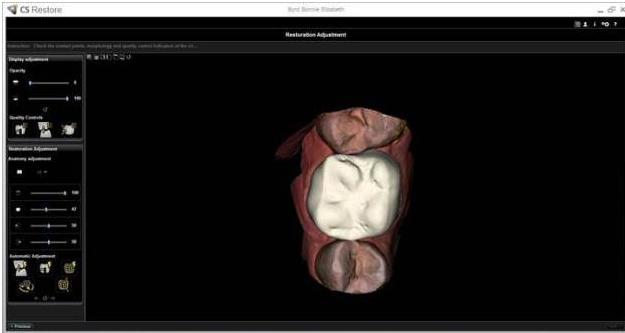 The Carestream CS 3500 intraoral scanner offers a simpler and faster way to obtain impressions that can be used to make more accurate dental restorations than traditional methods. The CS 3500 is a handheld device that connects to our existing computers using a standard USB cable. It uses no messy powders or other uncomfortable impression materials that need to be mixed or have to set before they can be used. Because it works with our existing computers, all we have to do is open your file and start scanning. The images go right into your file, so your records are kept securely in one place. It also means our administrative tasks are kept to a minimum, so we have more time to focus on patient care. This scanner, while high-tech, is quite simple to use. Once connected to a computer or laptop, it is designed to be easy for right-handed or left-handed staff. The light projection system allows us to focus on you instead of a computer screen, while still providing a precise impression and accurate restorations. The scanner has a feedback mode that uses a small green light to let us know the scan is going well, and a small red light to let us know if we’re moving too fast or an error has occurred. When this happens, we are able to immediately correct the error. The scanner also has a guide mode that makes it easy for others in our office to learn to use the device. More people able to use the device means less waiting. Light guidance assures that we are able to see what we are scanning and ensures we get all the information we need the first time. The device has two interchangeable tips, one in a standard size, and a second in a smaller size for children or those with smaller mouths, making the process as comfortable as possible. The scanner works much faster than other impression methods, two minutes for a full arch, less for smaller areas. The digital image can be sent to the lab digitally, in a matter of minutes, making the entire process much faster and easier. 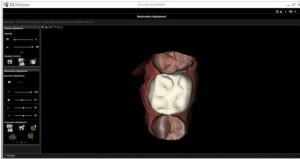 The scanner also captures full color images that differentiates soft tissue from enamel or dentin, which gives us greater accuracy when working below the gum line. We can also take close up, full color photos during the scan. This allows those in the lab to create highly accurate crowns and other restorations with no uncertainty. This level of accuracy ensures that we get it right the first time.